Mumbai: Percept Live, the organiser of FLY Music Festival, India’s first ever mutli-genre music event has announced that the festival stands cancelled due to unforeseen circumstances. All ticket holders who booked their tickets via Book My Show or Kya Zoonga will be contacted immediately for a full refund. Manuj Agarwal CEO Percept Live, said, “We launched Fly Music Festival with the single objective of providing an extensive international line up and great festival experience to our live music lovers. We managed to create a never before seen international line up to ensure this was possible” . Manuj Agarwal said that an initiative of this magnitude had its challenges that required time and consideration, which the company sadly underestimated. He further said that due to the extremely tight timelines between their announcement and the actual event, FLY Music Festival could not garner the reach and hype that an event of this stature required for successful execution. He said that the unseasonal rains in Delhi also caused delay in the massive production required. He said that Percept Live had approximately 200 people from various bands flying in from across the globe for FLY Music festival and did not want to taake a chance of them not being able to perform in a conducive environment. “We take complete responsibility for not being able to deliver the promised music experience to fans and artists and apologise unconditionally. We promise to reschedule FLY Music Festival,” he said. 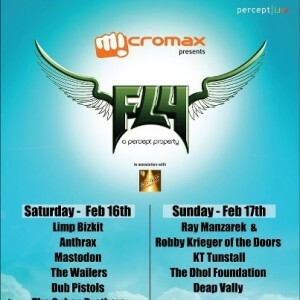 FLY Music Festival was scheduled to take place simultaneously in Bangalore and Delhi on 16th and 17thFebruary, 2013.